Carlos Santana can obviously shred his axe, but in a few years he's going to save your soul. The 61-year-old guitarist says he's going totally 'Supernatural' in six years and plans on becoming a church minister in Hawaii. 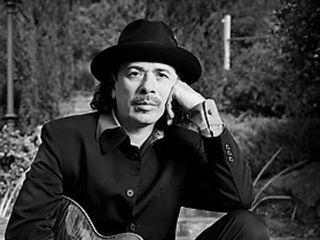 But unlike other musicians who have woven religion into their music, Santana says he'll hang up his guitar when he steps up to the pulpit. "I'm going to stop playing when I'm 67 and work on what I really want to do, which is to be a minister, like Little Richard,"Santana claims. "I'm not sick of what I do, but I find that God gave me the gift of communication even without my guitar and with the ability to get people unstuck with certain sections of the Bible having to do with guilt, shame, judgment and fear." Santana's 34-year-marriage ended last year, and since then he's been living alone and overseeing a variety of business ventures, such as his women's shoe line, Carlos by Carlos Santana, which has racked up $100 million in sales. But the guitarist is resolute that the ministry is his destiny: "The real God is beauty, grace, dignity and unconditional love. And I'm the kind of motivator who can motivate people to believe that what I'm saying is good for them." On October 12, Santana wraps his latest tour in Concord, California.So the next time he hits the road, you'd better check him out. Might be the last time you see him with a guitar round his neck.